Happy New Year from Wikimedia DC! I am pleased to announce that Wikimedia DC has a new schedule of standing meetups: WikiSalons will be held on the second Wednesday of each month, while dinner meetups will be held on the last Saturday of each month. This schedule is in effect through December. We adopted this new standing schedule to make planning events easier. We will also announce other events throughout the year, including more edit-a-thons, so be sure to check the schedule often! You can find the latest schedule on the DC meetup page on Wikipedia. Coming up in January we have two meetups: the WikiSalon on January 14 at 7 PM and the dinner meetup at Vapiano on January 31 at 6 PM. We hope to see you at our events! As usual, if you have any questions or request any special accommodations, feel free to email info@wikimediadc.org and we will be happy to help. Wikimedia DC held its first ever Open Government WikiHack this past April, at the offices of the Sunlight Foundation. We spent the weekend experimenting with open data repositories, including those made available by the Sunlight Foundation, trying to figure out how we can take this data and use it to improve Wikipedia. We imagined a world of Wikipedia articles that update automatically as new information comes to light. This month, we are going to continue imagining. The link between Wikipedia and structured data is Wikidata, a fairly new project spearheaded by the Wikimedia Deutschland chapter. The basic principle is that while Wikipedia exists in over 200 languages, data exists as data regardless of language. For example, the population of South Africa is 54,002,000, according to a 2014 estimate. You can find this datum in the Wikipedia article on South Africa, alongside the right side of the article. You can also find data on South Africa in its Wikidata entry, Q258. In the long run, data used in Wikipedia articles will be fed out of Wikidata, rather than posted directly on each article, so that the data will be automatically available in the many language editions of Wikipedia. Wikidata is fairly new to all of us, so we have invited James Forrester to give a presentation on Wikidata and how we can help improve it. Mr. Forrester is a product manager at the Wikimedia Foundation, focused on improving Wikipedia’s editing experience, and has also been a very active participant on Wikidata from the beginning. We are very excited to see him come to the National Archives and help us make Wikidata part of the broader Open Data conversation we’re having in the nation’s capital. We would love to have you participate in our WikiHack, which will take place on September 27–28, regardless of experience with coding or editing Wikipedia. You can register for free at EventBrite. Hope to see you there! This past July, programmer Ed Summers created CongressEdits, a Twitter feed that posts an update every time an edit to Wikipedia is made anonymously from an IP address belonging to the United States Congress. Wikipedians who edit through a registered account have their edits attributed to their username, while those who edit without being logged in have their edits attributed to their IP address. The range of IP addresses used by Congressional offices is public knowledge, and the Twitter bot reports only those where the person posting wasn’t logged in. In fact, Wikipedia administrators have been watching out for Congressional edits for years. CongressEdits provided a new level of visibility to these edits. The Twitter account has around 30,000 followers as of writing; by comparison, the English-language Wikipedia has 1,400 administrators. The visibility and resulting press coverage generated a lot of interest in Wikipedia on the Hill—particularly since some of the edits are disruptive (and sometimes downright hateful). That said, they are mostly the kind of juvenile or disruptive edits that Wikipedia deals with every minute of every day without incident, notable only because of where the edits are coming from. Over the years Wikipedia has developed sophisticated technologies, including filters that prevent certain edits from even happening, that ensure that most trivial vandalism gets swiftly undone. Most press coverage of CongressEdits has focused on acts of vandalism, and one would think we would want to chase Congressional staff away. In fact, Wikimedia DC welcomes edits by Congressional staff and the staffs of federal government agencies. Government staff are experts in areas of public interest, including very new hot topics. They play a promising role in our mission to make a better online reference work, with notable, neutrally phrased, verifiable content. We can overlook minor discretions and work with Capitol Hill and all federal employees to forge a path forward. Recently we partnered with the Cato Institute for a panel on editing Wikipedia on Capitol Hill. You can read about it inU.S. News and World Report. Cato and Wikimedia DC both agree that Congress does have a part to play in Wikipedia—not political advocacy, but transparently improving the quality of information about legislation and other Congressional activity. This includes not just direct edits to articles, but making data about government more open and machine-readable for reuse in highly visible third-party platforms like Wikipedia. There is a great potential for Wikipedia as a platform to increase awareness of Congress’ activities, a potential we should not overlook. Wikimedia DC is interested in developing best practices for employees at all levels of government. 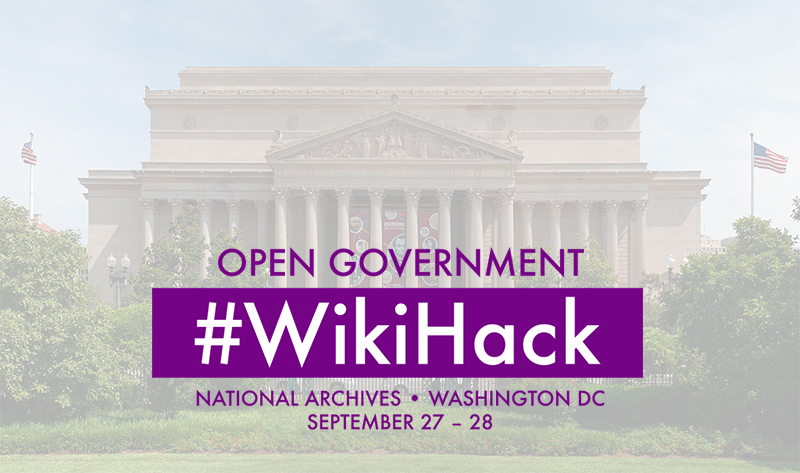 The National Archives and Records Administration (NARA) has been working with the Wikipedia community since 2011, pioneering government engagement with Wikipedia and showcasing the potential to serve the public. Look into other agencies’ best practices. Some agencies have published best practices on Wikipedia participation, including NARA, the Department of Health and Human Services, and the National Institutes of Health. These are best practices you may wish to incorporate, should you have the opportunity to develop best practices for your own agency. We also recommend reading Why CongressEdits Matters for Your Agency on DigitalGov. Peter Meyer is the Treasurer of Wikimedia DC and the Chair of Wikimedia DC’s Public Policy Committee. James Hare is the President of Wikimedia DC. Wikimedia DC works on the ground in Washington, DC, and in the surrounding area to teach others about Wikipedia. We are proud of all that we’ve accomplished in our three years, from our large gatherings like Wikimania 2012 and WikiConference USA, to our regularly held edit-a-thons with cultural and educational organizations throughout DC. We are also excited about the future; we are in the midst of our expanding our program offerings so that we can do more to serve DC and to improve the Wikimedia projects. If you’re well versed in the ins and outs of Wikipedia editing, we always need Wikipedia trainers for our edit-a-thons. You will have the opportunity to share your knowledge of Wikipedia with someone eager to learn. If you are interested in this opportunity, email james.hare@wikimediadc.org or just show up to an upcoming event. Have something interesting to share about the Wikimedia projects, free knowledge, open source software, open data, or open government? We are looking for guest bloggers to make occasional contributions to our blog. Your writing will be shared with the broader Wikimedia community here in DC and around the world. Feel free to email recommendations to james.hare@wikimediadc.org. Our organization is aided by the advise of our committees. We have three committees focused on programs: Content Programs Committee, Technology Programs Committee, and Community Programs. We also have committees dedicated to fundraising, governance, public policy, and technical infrastructure. If you are interested in serving on any of these committees, send an email to info@wikimediadc.org. Thank you very much for your interest. We hope to see you help out at Wikimedia DC! I am pleased to announce our fourth annual picnic, the Great American Wiknic, will take place at Meridian Hill Park in Washington, D.C. on Sunday, July 13 from 1 to 5 PM (rain date: July 20). We will be hanging out by the statue of Dante Alighieri, a statue that was donated to the park in 1921 as a tribute to Italian Americans. Read more about the statue on Wikipedia. If you would like to sign up for the picnic, you can do so here, or you could email James Hare at james.hare at wikimediadc.org. When signing up, say what you’re going to bring! July will also feature the third annual Great American Wiknic in Frederick, Maryland. This year’s Frederick picnic will take place on Sunday, July 6 at Baker Park. Sign up here for the Frederick picnic. What else is going on in July? We have the American Chemical Society Edit-a-Thon on Saturday, July 12, dedicated to notable chemists, and our monthly WikiSalon on Wednesday, July 16. As we come into the longest days of the year, we prepare for the “Summer of Monuments” campaign, focusing especially on those Southern states whose history and present are underrepresented on Wikimedia Commons. These are a contiguous block of states extending from the East Coast to the middle of the country: Georgia, North Carolina, Tennessee, Kentucky, Missouri, Arkansas, Mississippi, Louisiana, Oklahoma, & Kansas. At the forefront of this effort will be local historians, librarians, photographers, and anyone else working passionately to preserve and analyze our culture. We are pleased that we can offer prizes to the best photographers and to the institution that contributes the most valuable collection. But we also hope to demonstrate how Wikimedia Commons can be a valuable ally for historians—an amazing free resource for sharing and preserving their materials. If all goes well, we can use our Monument momentum to develop Wikipedia even further in some of these less-digitized areas. We are seeking communities (be they interested in a specific location or in a theme, such as the civil rights movement) that we can support in their use of Wikipedia to catalogue and preserve the resources and information they value. We are also calling all Wikipedians who live and work in these ten Southern states to join us in this project, and to share with us their ideas for creatively expanding our collective encyclopedic project. Pay attention, because Wikimedia DC doesn’t get to say this every day: we are hiring. That’s right: Wikimedia DC is hiring for a five-month contract position to manage the Wikipedia Summer of Monuments program. Summer of Monuments is an outreach campaign modeled off of Wiki Loves Monuments, a photography contest successfully carried out in the United States in 2012 and 2013. The goal of Wiki Loves Monuments was to get pictures of historic sites, recognized on the National Register of Historic Places. Two years of contests resulted in 30,000 pictures uploaded, enhancing Wikipedia’s coverage of these historic places. We got the idea for Summer of Monuments after seeing that despite two years of these contests, the contest benefits some parts of the country more than others. That is to say, 30,000 uploads later, there are still states where fewer than 50% of the registered historic sites have pictures on Wikipedia. Most of these states are in the South, including Arkansas, Oklahoma, Kansas, North Carolina, Mississippi, Missouri, Kentucky, Georgia, Tennessee, and Louisiana. To get the pictures of the sites we need, we will carry out a campaign that involves reaching out to county historical societies, individual photographers, and contributors on Wikipedia. The campaign will extend nationwide in September, comparable to the Wiki Loves Monuments contest held over the past two years. Your job will be to help develop and execute this campaign, supplementing the efforts of an enthusiastic online community. Wikimedia DC is looking for a project manager to run its Wikipedia Summer of Monuments campaign in 2014. This will be a paid contract position that will begin in May and end in mid-October. This position is based in Washington, DC, but some travel (with expenses paid) will be required as part of the job. To apply for the position, please e-mail a cover letter and résumé to James Hare at james.hare@wikimediadc.org. We will contact you if we are interested in further consideration of your application. No phone calls, please. Press release announcing the results of Wiki Loves Monuments 2013. We are very pleased to announce our upcoming edit-a-thon at the Library of Congress on Friday, April 11, the first event we have had with the Library since the Google Opening Reception of Wikimania 2012 nearly two years ago. We think it is only fitting that the world’s largest encyclopedia would partner up with the world’s largest library. Our event will focus on the Africa Reading Room, which includes books on African and Middle Eastern history. We have selected this—out of all of our options—because we are in a position to address a long-standing issue on Wikipedia. There has been much press coverage of Wikipedia’s gender gap, resulting in an encyclopedia that reflects the prerogatives of its overwhelmingly male authorship. This means there are more articles about men than women, to such an extent that some incredibly accomplished women go years without having articles on Wikipedia. That is only part of the systemic bias equation. Wikipedia also has a Western bias with regards to what is written about. Statistics collected by WikiProjects, which are informal groups of Wikipedia editors, provide evidence of this problem. WikiProject Africa reports that there are 57,753 articles regarding Africa on Wikipedia, while WikiProject United States reports that there are 227,878 articles on topics relating to the United States. To give some perspective on this, the United States is just one country, hosting 4% of the world’s population, while Africa is a large, diverse continent with 54 countries and over one billion people. This is obviously lopsided, so we need your help. To help, meet us at 9 AM on Friday, April 11 in the lobby of the Madison Building. Use the entrance on C Street, by the Capitol South Metro station. You will need to check your coat in the cloakroom; personal items you wish to bring with you must be transported in a clear plastic bag. If you do not already have a Library of Congress researcher card you will need to get one before proceeding to the Africa Reading Room. We will be editing from 10 AM to 1 PM. If you are new to Wikipedia we will be more than happy to help you get started—everyone’s a newcomer at first! After 1 PM, you will be able to get lunch at the Library’s cafeteria and stay for as long as you would like. In the long term, we would like to see Wikipedia editors continue to use the Library of Congress as a resource for improving Wikipedia, whether independently or during future Wikimedia DC events. We would also like to build a brain trust of people who are interested in Africa and are eager to do their part to improve Wikipedia. To sign up for this upcoming event, check out our event page on Wikipedia. If you cannot come Friday the 11th but wish to still help, send an email to kristin.anderson [at] wikimediadc [dot] org. What If Wikipedia Could Update Itself? This post was originally featured on the Sunlight Foundation’s blog. There will be a happy hour At Sunlight Foundation on Friday April 4 and the hack will begin the next day. Feel free to share with your networks with #wikihacks on Twitter and if you have any questions, please email us at: info@wikimediadc.org. Did you know what the Laurel Sanitarium was? The Laurel Sanitarium was a prominent mental health facility and women’s nursing home, built in 1905 to treat mental illness and addiction. The sanitarium treated as many as 50,000 patients from its opening until 1963, when its founder Jesse C. Coggins died. The building was subsequently demolished in 1964 to make way for the Laurel Shopping Center. Part of the building grounds were sold to the county government of Prince George’s County, Maryland, which eventually led to the construction of Laurel High School. I learned about this demolished sanitarium from the humble, two-paragraph Wikipedia article on the subject, linked above. This piece of Maryland local history was not documented on Wikipedia until November 16, 2013, when it was one of the new articles contributed as part of the Laurel History Edit-a-thon. The Laurel Historical Society hosted this gathering, with the assistance of Wikimedia DC, to help improve Wikipedia’s coverage on notable pieces of local history. To support this effort, we had access to a treasure trove that you can’t find on the Internet: archival copies of the Laurel Leader newspaper, dating back decades. If you look at the references section of the Laurel Sanitarium article, you will see three citations made to an article published in the Laurel Leader, in addition to two online sources. The article in question, “Laurel Landmark Passes As New Community Is Planned On Site,” was published in the Leader on August 27, 1964, and now serves as the source for most of the article. Wikipedia requires that its millions of articles be based on information already published in reliable sources. To an eager Wikipedian at his or her computer, the easiest reliable source to find is an online source. Yet by partnering with a local historical society—very much in the business of collecting historical sources—we have enabled access to a harder-to-find source of information. We can use this information to help bring Wikipedia closer to completion. Wikipedia’s mission is to make the world’s information available to all for free, and the help of the Laurel Historical Society and other local historical societies helps make this possible. I would like to thank Lindsey Baker and Abram Fox for organizing the edit-a-thon this past November. Wikimedia DC is very much interested in more of these kinds of events, so if you have any ideas, do let us know at info@wikimediadc.org!